Race Legends offers a wide-range of services for the motorsport celebrity, event planners, organizes, authors and artists. 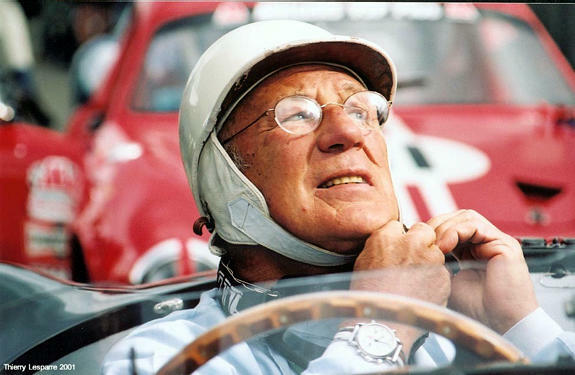 Sir Stirling Moss at the 2001 Tour de France. Vintage racing, merchandising, club appearances, charity auctions. The demands on your time can seem even greater than when you were competing. And perhaps now, that crack team isn’t always on hand to take care of scheduling and travel arrangements. Race Legends specializes in changing what might have been unwelcome demands on your time into opportunities. Opportunities for you to select the right events to attend and merchandising deals accept. Opportunities to enjoy meeting old friends, loyal fans and even the younger generation of racing enthusiast meeting a legend for the very first time. All without the often stressful and chaotic arrangements that all too typically surrounded events. 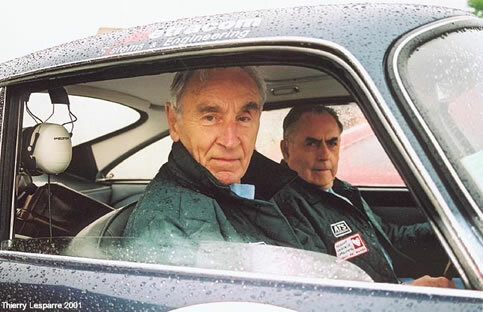 Roy Salvadori and Sir Jack Brabham share an Aston Martin in the 2001 Tour de France. By engaging Race Legends as your agency, we will take care of the small, but important details that come with making a vintage race meeting appearance, speaking at a corporate meeting or agreeing to sign a set of limited edition prints. You share your business and travel parameters and we negotiate your participation. How and when you travel, necessary accommodations, even off-track activities for your spouse or family to enjoy while you’re “working”. We’ll even place a Race Legends representative at the event to ensure that everything goes smoothly and that any wrinkles in the plans are quickly and professionally ironed out. Sir Jack Brabham featured in the Road America 2002 Event Program. Race Legends provided media and other content. More vintage events on the calendar. More fans wanting to see something new each season. The motorsports legends maintain private lives. All these factors add increasing pressure for you to get the right celebrity for you events. How do you contacts that F1 champion? What activities will the participate in during the event? What do they charge for an appearance? What travel and accommodations arrangements do they require? Race Legends has the answer to these and other questions that can vex even the most hardened event coordinator. You don’t even have to have a particular celebrity in mind. Just a date, activities and a general idea is all we need to consult with our extensive motorsport celebrity network. If you have an event that requires a special motorsports legend, Race Legends is the first and last place to stop to handle all the arrangements. See our handy “Event Checklist” for help in an appearance by a motorsports celebrity at your event something truly memorable. Race Legends specializes in producing and maintaining some of the finest “official” motorsports driver sites in the world. The spread of the Internet has made it possible to reach a wide audience worldwide and now is the time to ensure that your accomplishments are presented the way you want them to be. While many fans-produced sites have tremendous content and clearly are a labor of love by the producers, they aren’t the same as having your own site – under your full control. Find out how some the world’s most popular motorsports legends are using Race Legends to build and maintain their online presence. Some times one of the hardest aspects of getting that new book or print project rolling is finding and contacting a particular celebrity. That’s were Race Legends comes in. We maintain an extensive, worldwide network of motorsports contacts. If you need to talk to a racing legend or propose a print signing deal, we can get you touch with them. For artists, we specialize in the arrangements for a print signing session. We handle all aspects from the business parameters down to ensure that the prints are signed just as you’ve requested. We also have contacts amongst various motorsport galleries and merchandisers to assist you in the distribution of your work.